The old adage that all good things must come to an end apparently holds true for the weather as well. 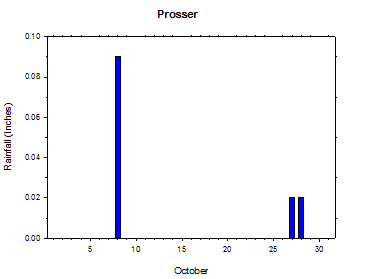 October temperatures at Prosser were cooler than average, which ended an impressive streak of above normal temperatures during 14 of the preceding 15 months. Despite the unsettled beginning and end, October was nonetheless pleasant thanks to a long period of dry and calm weather during the middle to latter part of the month. Although western areas were mired in fog and low clouds for much of that time, eastern Washington experienced mainly sunny and mild days. October mean high temperatures were spatially variably but generally near average, while low temperatures were notably below average. The cool and wet start to last month included a high temperature of just 46 degrees at Crane on October 2nd, as well as 0.91 inches of rainfall at Tokeland. The morning of October 4th brought the first notable frost of the autumn to Washington, with low temperatures as cold as 26 degrees at Pullman. A storm passage on the 7th dropped 0.77 inches of rain at Snohomish, while sustained winds of up to 35 mph were recorded at St. John. A strong high pressure ridge arrived for mid October, bringing sunny days and cool nights to areas east of the Cascades from the 13th to the 26th. For instance, the low at Fairfield (south of Spokane) on October 14th was only 24 degrees. Unfortunately, low level moisture and stable conditions contributed to a persistent layer of low clouds in western Washington during much of the storm-free period. Conditions finally became more unsettled on October 27th, as a weather system brought as much as 0.3 inches of rain to parts of Washington. A rare wind event from the northeast blew through Washington on October 28th, with daily average values as high as 30 mph at St. John, and all-time record sustained and wind gust values measured in parts of central Washington. As dry air poured into the region, the morning of the 29th featured very chilly temperatures. The low temperature at Pullman on the morning of the 30th was 17 degrees, which was their coldest temperature since late January! Overall, October was a fairly dry and cool month, especially at night. October began with cool, unsettled, and locally breezy conditions. Lows on the 1st were as cool as 33 degrees at Broadview, and highs reached only 51 degrees at Green Bluff (near Spokane), while 0.74 inches of rain fell at Tumwater SW (near Olympia). The low temperature on the 2nd dropped to 30 degrees at Pullman, and marked the first frost morning of the fall for Washington, albeit at only two stations. Although a few stations surpassed 60 degrees in the afternoon, numerous locations in north central Washington failed to reach 50 degrees. Crane topped out at just 46 degrees on the 2nd, which was their coldest daily high since March 24th. Another weak storm brought more rain to western areas, as Tokeland received 0.91 inches. Lows on October 3rd were as cold as 30 degrees at Ritzville, as several stations recorded the autumn's first frost, although drier air and sunshine allowed for daytime highs as warm as 68 degrees. High pressure and dry air allowed for very chilly lows on the morning of October 4th, as minimum temperatures dropped to 26 degrees at Pullman and 28 degrees at Broadview (Ellensburg). Still, daytime highs peaked in the mid to upper 60s in the lower Yakima Valley. October 4th and 5th were mostly sunny and warmer, with numerous 70s returning to the region. Lows moderated slightly on the 5th, but still bottomed out below 32 degrees in some areas. The morning of October 7th was much milder, as another storm passed through the state. Rain, clouds, and windy conditions occurred, although parts of central Washington topped out near 70 degrees again. 0.77 inches of rain fell at Snohomish in the Puget Sound Convergence Zone, while 15 minute sustained winds topped out at 35 mph at St. John. Showers and cool high temperatures were the rule for October 8th, as Pullman NE reached only 47 degrees, and parts of south central Washington received more than 0.25 inches of rain. 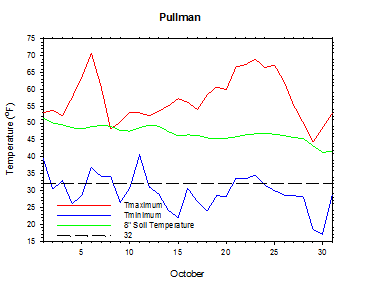 Lows were as cold as 27 degrees at Pullman on October 9th, although warmer and drier conditions prevailed by afternoon. High temperatures in many areas reached the 60s, although Huntsville topped out at just 45 degrees. After a low of 31 degrees at Pullman on the 10th, highs topped out in the 50s in the east and west, and reached the 60s to around 70 degrees in central areas. Light rain occurred in parts of western Washington, though most areas were fairly dry. After a showery and cool October 12th, high pressure built into the region, and began an extended period of benign weather. The weather was sunny and pleasant by day and chilly and calm by night during the middle of October. Pullman dropped to 22 degrees on the 15th. 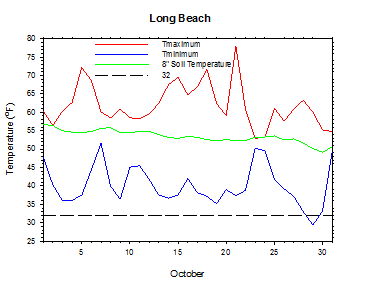 However, offshore flow and sunshine allowed Long Beach to climb to 68 degrees on October 14th, while Vancouver reached 70 degrees on the 15th. A weak system dropping in from the north brought a few clouds and just enough mixing to make for a milder morning on October 16th, as only a few sites reached sub-freezing temperatures. High temperatures were in the 60s in parts of western Washington, while Puget Sound areas that failed to break out of the low clouds remained mired in the 50s. Otherwise, temperatures ranged from the upper 50s in eastern areas to the 60s in central Washington. On the 17th, the low temperature dropped to 27 degrees at Pullman, but later the high temperature reached 69 degrees at Wapato. Low clouds and fog kept much of western Washington cool in the day and mild at night through the 24th. However, sunshine and mixing sent Long Beach to 78 degrees on the 21st, while Peshastin (near Wenatchee) reached 74 degrees. Much of central Washington reached the 70s on the 20th and 21st, while overnight lows also moderated. High temperatures on the 22nd ranged from 75 degrees at Vancouver to 49 degrees at foggy Sequim. Light rainfall of up to 0.32 inches impacted much of the state on October 27th, which caused cool day-time temperatures. Although highs surpassed 60 degrees in parts of western Washington, temperatures peaked in only the upper 40s to mid 50s in south central Washington. The long period of benign and pleasant weather was literally blown away on the 28th, as strong winds slammed the region. The cause of the gale was an unusual setup involving a potent storm dropping down from the north, which was followed by strong Canadian high pressure in its wake. It is very rare to have such strong winds from a northeasterly direction. Outlook recorded an all-time record 15 minute sustained wind of 37.3 mph, and Sunnyside reported a record wind gust of nearly 46 mph. Amazingly, St. John's daily average wind speed for October 28th was 30 mph. High temperatures east of the Cascades reached only the mid 40s to mid 50s, despite the sunshine, while Long Beach was the warm spot in the state at 63 degrees. 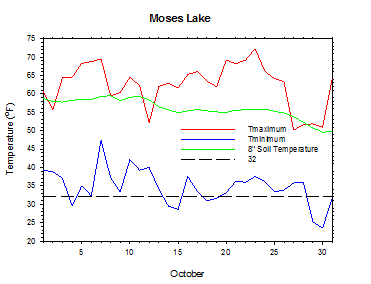 As winds decreased overnight, temperatures dropped as low as 18.5 degrees at Pullman and Moxee on the morning of the 29th. Highs reached only 43 degrees at Anatone, although much of western Washington approached 60 degrees. October 30th was another chilly morning in the east, as Pullman was the cold spot at 17 degrees. Light rain arrived in western areas late on the 30th, and lingered into the morning of the 31st. 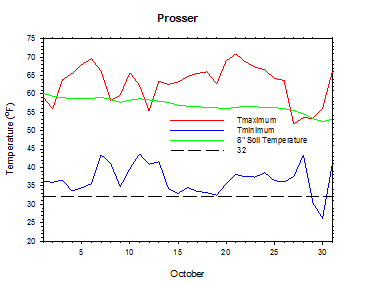 The average October temperature at Prosser (WSU IAREC) was 48.7°F, which is 1.8 degrees (1.2 standard deviations) below average. The average high temperature was 62.9°F, which is 0.1 degrees below average. The average low temperature was 36.7°F, which is 2.3 degrees (1.2 standard deviations) below average, and the coolest since 2002. The maximum temperature recorded last month was 70.9°F on October 21st, while the coolest daily high was 51.8°F on October 27th. 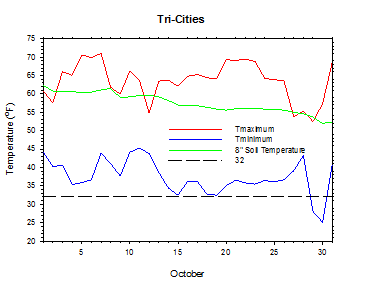 Low temperatures ranged from 43.7°F on October 11th to 26.2°F on October 30th. Daily average temperatures ranged from 55.2°F on the 7th to 41.3°F on the 30th. The monthly precipitation total was 0.13 inches. The average wind speed was 4.0 mph, and the average 8 inch soil temperature was 57.0°F. Wenatchee (WSU TFREC) recorded an average temperature of 48.3°F, which is 1.1 degrees below average, while Walla Walla's average monthly temperature of 49.0°F was 2.7 degrees below average. 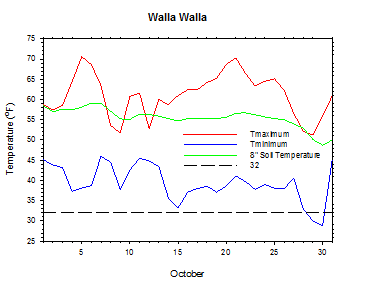 Pullman was one of the cooler spots in eastern Washington, with an average October temperature of 43.1°F. In western Washington, Mt. 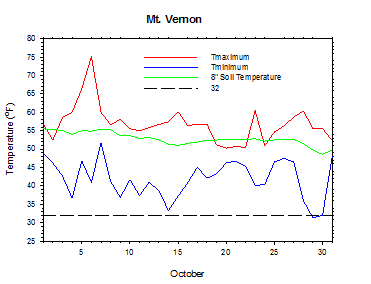 Vernon's average temperature was 49.1°F, which is 1.3 degrees below average. October 2nd: The high temperature at Crane was only 46 degrees. October 4th: The low temperature at Pullman plunged to 26 degrees. October 7th: The 15 minute sustained wind at St. John peaked at 35 mph. October 28th: The daily average wind speed at St. John was an incredible 30 mph. 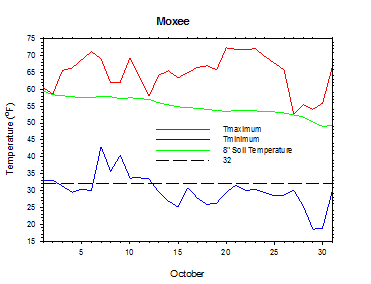 October 29th: The temperature at Moxee plummeted to 19 degrees. As of October 21st, Lincoln County's winter wheat crop was doing well, while potato and corn harvest continued in Grant County. Apple harvest continued in the Yakima Valley, with Jonagold and Honeycrisp coming in from the Upper Valley, and Fuji and Red Delicious coming in from the Lower Valley. The hop harvest was mostly complete as of mid to late October. Otherwise, raspberry growers in Thurston County capitalized on the nice weather to prune, while new plantings were going in for blueberries. As of October 28th, Whitman County fall wheat plantings were emerged and looking healthy, while Adams and Lincoln County winter wheat planting was completed. Meanwhile, the central Washington apple harvest was wrapping up for the season. In western Washington, Christmas tree growers continued preparing for harvest, while pumpkin sales were reported to be brisk (National Agricultural Statistics Service). 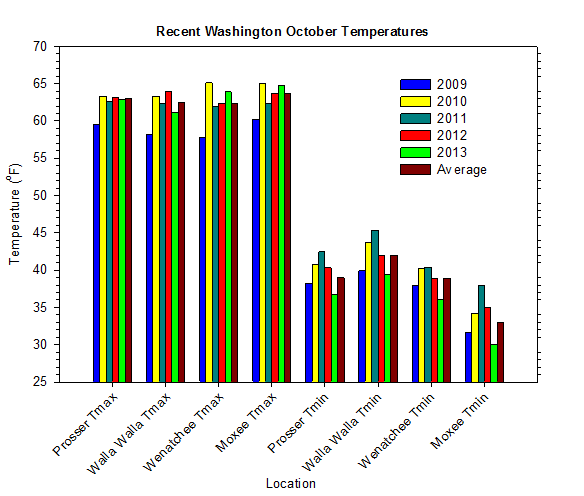 On Halloween, October 31st, 2002, the temperature at Moxee plunged to 1.8 degrees, which is one of the coldest temperatures ever recorded so early in the cold season in Washington. According to the Climate Prediction Center (CPC), slightly below average temperatures are expected in the east during November, along with near average precipitation statewide. During the winter season, there are no clear signals to suggest large departures from normal conditions. ENSO Neutral conditions are likely to persist into the spring.